Alec Shuttleworth of Keighley purchased TriVelox Gears Limited in 1940 and renamed the company the TriVelox Gear Company. At some date between 1940 and when Smart & Brown (Engineers) Limited started to manufacture the gear at its Spennymoor factory after the Second World War, Smart & Brown must have purchased the rights to do so from Shuttleworth. How did this purchase come about? The answer is: "It came about because of the war!" 'Smart & Brown were originally based near London. However, early in 1940 the Government organised factory-sharing schemes that enabled manufacturers of essential items like machine tools to move to safer locations. As a result, the workforce and their families were initially evacuated to Keighley in West Yorkshire'. In Keighley the company was based on the site of The Rustless Iron Company Limited, or TRICO, in Lawkholme Lane. The site was close to the Tanfield Buildings premises of Alec Shuttleworth . The company also occupied all or part of an old textile mill in Cottingley, a village about six miles from Keighley: today the mill is one of a number of buildings that constitute the Cottingley Business Park . 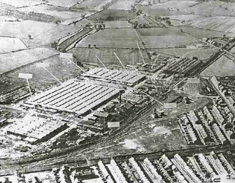 In both Keighley and Cottingley, Smart & Brown began to manufacture a variety of products for the armed forces and continued to do so throughout the war. At about the same time that Smart & Brown arrived in Keighley, Alec Shuttleworth was promoting the TriVelox gear from his business in Tanfield Buildings, perhaps relying on old stock brought from Coventry to meet customer demand. Evidence for this is provided by a sticker he attached to the covers of old Coventry Bicycles catalogues. It is virtually certain, therefore, that Shuttleworth, following contact with employees of Smart & Brown, sold the rights to the TriVelox gear to the company while it was based in Keighley during the Second World War. In 1945 Smart & Brown (Engineers) Limited moved from Keighley to a trading estate on the outskirts of Spennymoor that had been established on the site of an old Royal Ordnance factory. It probably made the move with the assistance of the Industrial and Commercial Finance Corporation (ICFC). The Corporation was formed in 1945 by the Bank of England and the major British banks to provide long term investment funding for small and medium-sized enterprises: for example, it helped Thomas Summerson & Sons, the railway engineers, to move to the Spennymoor estate in 1947/8 . 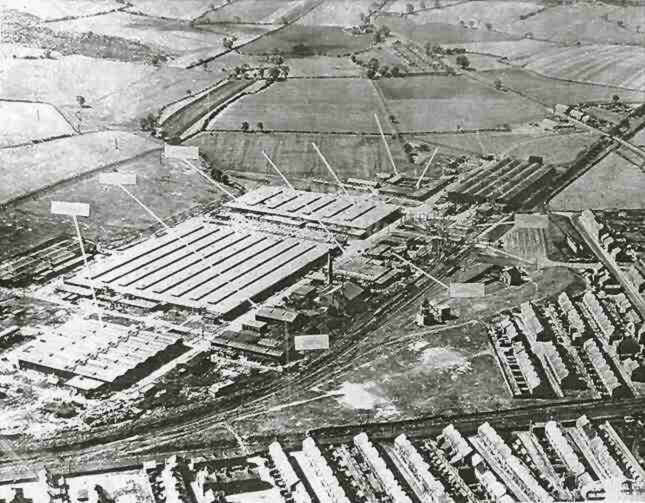 The estate, which was photographed from the air in the late 1940s, is known today as the Merrington Lane Industrial Estate. The Smart & Brown factory was the furthest from the camera of the three main buildings. Between the factory units and the houses can be seen the derelict pump house of the former Merrington Lane Colliery. During the war in Keighley, Smart & Brown had been making products solely for the armed forces: and so in peacetime it had to search for new markets and new products to serve them. These new products included a potato harvester, a paraffin cooker, and domestic electric switches and plugs, as well as the TriVelox gear . 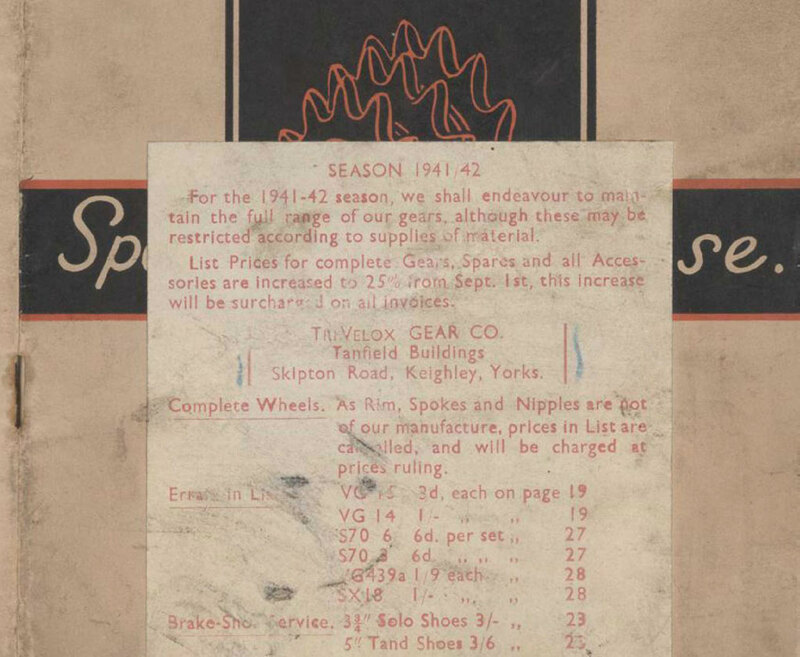 An early (undated) Smart & Brown advertisement for the gear attributes the product to the company's Cycle Gear Division and does not mention the Spennymoor factory, giving only the address of the company's head office in London. It employs the old Coventry Bicycles slogan, 'Speed with Ease': and the same slogan was employed in most of the company's subsequent promotions. 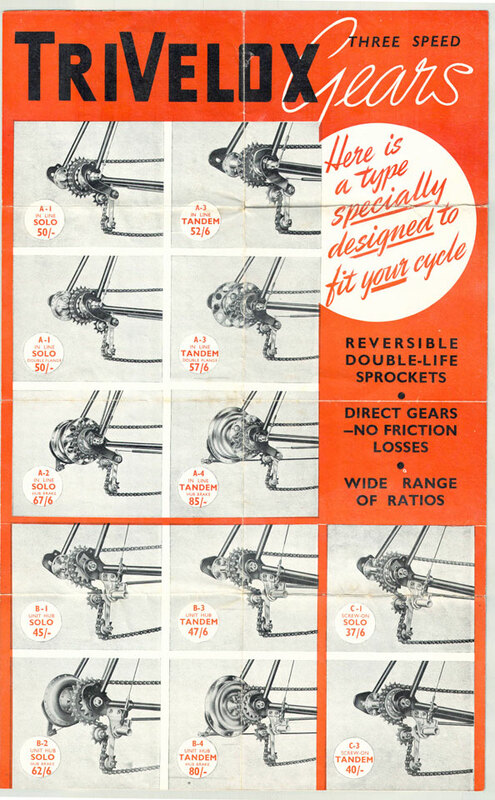 The gear displayed in the advertisement is the in-line version of the gear - the A model in the catalogue of Coventry Bicycles - although off-line models are said to be available as well. But the design of the gear clearly differs from that patented by Val Page of Triumph in 1935. 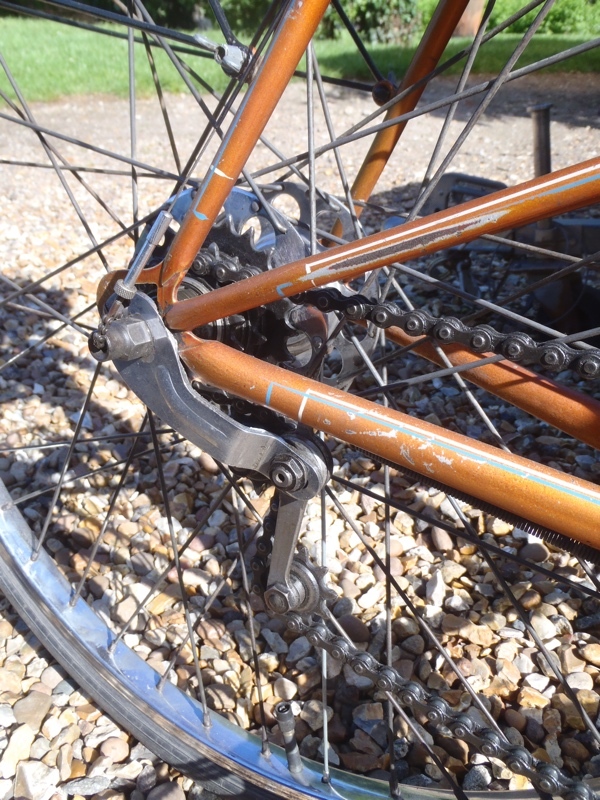 Although the mechanism is still inside the hub, as in Page's patent, the cable for changing gear by moving the cluster of sprockets is now on the off-side of the bicycle, as in the 1931 patent of Shuttleworth and Hill. By 1947, if not before, Smart & Brown had established a subsidiary company to manufacture and market the gear: the TriVelox Gear Company, the name chosen by Shuttleworth in 1940 . Some advertisements from 1947 give the address of the new company as the Trading Estate, Spennymoor. Others, such as the one shown here, still give the London head office address. It was probably in the following year, 1948, that the company produced a folding brochure which opened out into a poster. On the reverse of the poster were various photographs, diagrams, and written descriptions of the gear. Also given was the Spennymoor Trading Estate address. 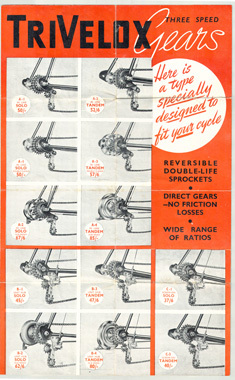 Twelve versions of the gear are shown on the poster. For the In-Line, A model, there are six versions, three for a solo bicycle and three for a tandem: within each type of machine there is a choice between the standard version, a double flange version, and a hub brake version. For the Unit-Hub, B model, there are only four versions (solo or tandem, with or without hub brake) and for the Screw-On, C Model, two versions (solo or tandem). 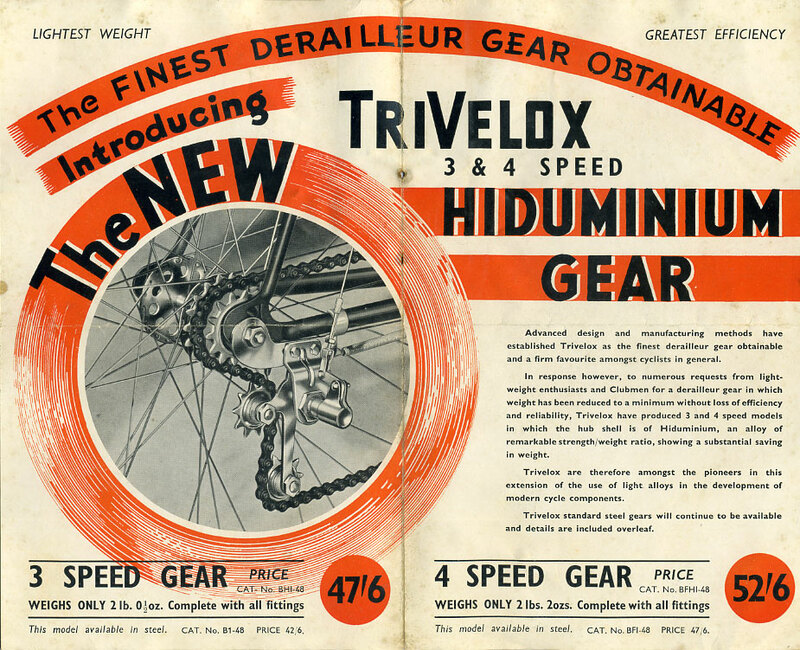 Among William Hill's effects is a TriVelox hub: the part number given on the barrel is A3-45-1 LF. It appears to be the Smart & Brown A-3, in-line, tandem, double (or large) flange hub shown on the above poster. The number '45' may refer to the year that Smart & Brown began to manufacture the gear, that is, 1945: it was certainly the year that Smart & Brown opened its factory on the old Ordnance factory site. Tony Jenkins, a member of the Veteran-Cycle Club, owns a 1948 Rensch tandem that is equipped with the same model of gear. The part number on his hub is identical to that on Bills. For some reason Bill seems to have been experimenting with the number and arrangement of the sprockets . Also around 1948 the company began to innovate by introducing a four-speed gear and using a lighter material than steel in order to reduce weight. The gear was promoted in a flyer as the TriVelox 3 & 4 speed Hiduminium Gear, named after the alloy used to manufacture the hub shell. The gear was probably a type B (Unit-Hub) model with a large flange hub. Whether or not the gear went into full-scale production - in particular, the four-speed version - is not certain: only the three-speed model (CAT. No. BHI-48) is shown in the flyer. By the late 1940s Smart & Brown (Engineers) Limited was rapidly failing. The company did not go bankrupt, however, because the ICFC stepped in to save it. Following its intervention the ICFC continued with only the profitable parts of Smart & Brown - the TriVelox Gear Company was not one of them - and eventually sold what remained to Thorn Electrical Industries in 1951. 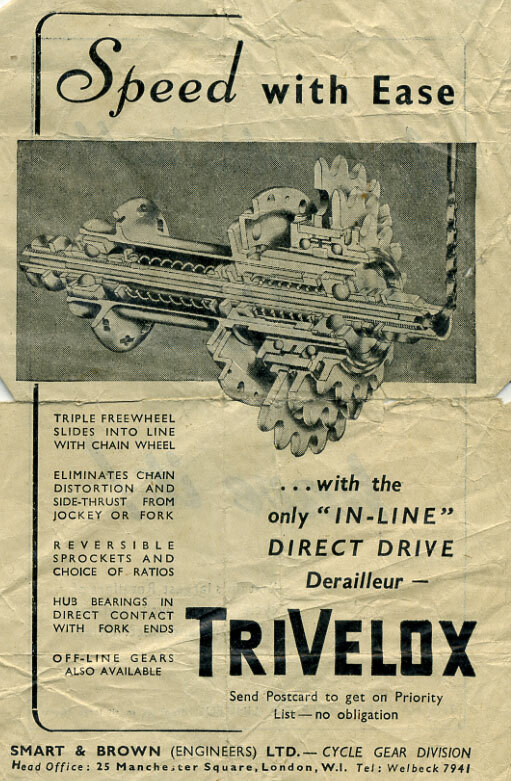 The move by the TriVelox Gear Company into lighter materials and a four-speed system had come too late: and as a result production of the TriVelox gear came to a permanent end. There is, however, a Postscript to the story! 1. See: Michael Stratton and Barry Trinder. Twentieth Century Industrial Archaeology. London: E & FN Spon, 2000, page 202. 2. Biggleswade Chronicle, 14 October 2008. Thank you to David Woolley of Llandysul for this reference. 3. YouTube Video. The reference to Smart & Brown occurs at about 12.08 minutes/seconds into the video. 4. Thank you to Margaret Krupa of Cottingley for this information. 5. This recollection was collected by the BBC in 2006. 6. See: James Flanders Hargrave. Competition and Collusion in the British Railway Track Fittings Industry: the case of the Anderston Foundry, 1800-1960. Presented for the degree of Doctor of Philosophy to the University of Durham, 1991, volume 2, page 63. This thesis is available online here. 7. For a discussion of the activities of Smart & Brown (Engineers) Limited during this period, see: Shirley K. Hammond. Multinational Tactics in a Traditional Coalmining Community: Conflict in Spennymoor. Presented for the degree of Master of Arts in Social Sciences to the University of Durham, September 1981, pages 37-40. This thesis is available online here. 8. It may be significant that the 1931 patent was due to expire in 1947. 9. On the Postscript page are two photographs, found among William Hill's effects, of what appears to be a prototype, four-speed TriVelxox gear. The source of these photographs is not clear. 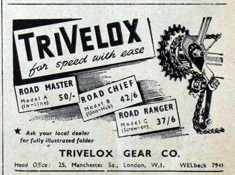 On the reverse of the second photograph Bill has written: 'Mock-up [4-speed] TriVelox Gear. Tested on our tandem OK.' The bicycle in the photographs, however, does not appear to be a tandem, and the hub is small-flange. 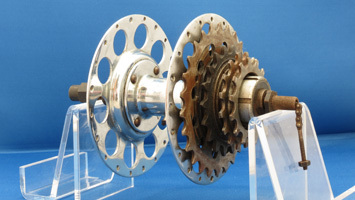 Bill may have been referring back to a test he carried out using the large-flange hub pictured here.